Each day here seems to melt into the next. 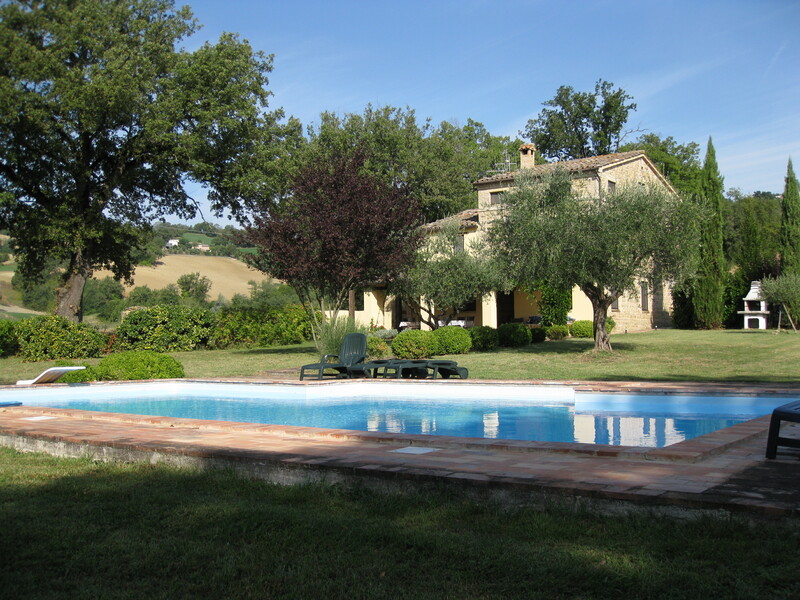 Since we’ve arrived at Casa Zazza, our temporary home in Le Marche, our goal has been to experience nearby towns and visit whatever seems interesting or historic near us. This takes strategy — so over a very long breakfast on one of our first days, we posted an enormous map on the wall, and charted a rough itinerary for the two weeks. That doesn’t mean adjustments can’t be made (they already have been), but it’s good to have a plan. Each morning and evening we consult the “camp calendar” and plot (or re-plot) our next move. One activity we’ve enjoyed so far is market day in nearby towns. 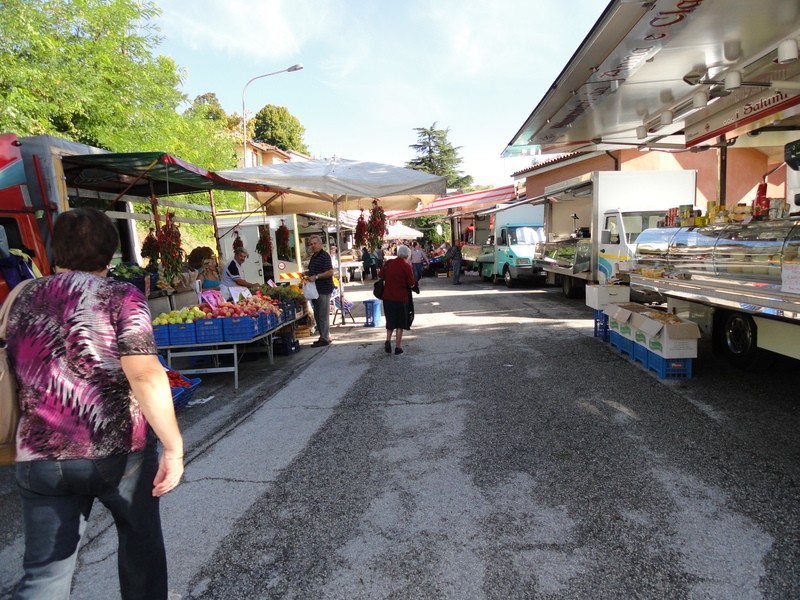 In the small hamlet near us, Gualdo, the market is not very big. 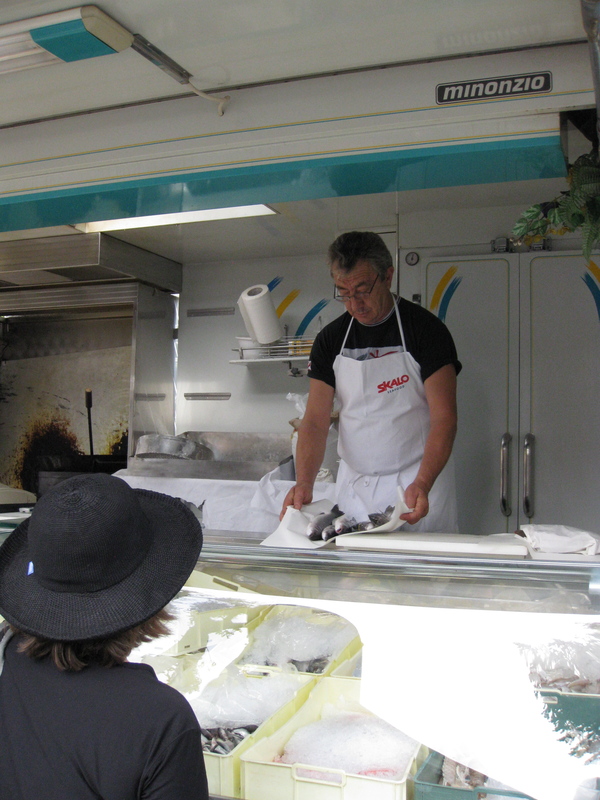 But we’ve made friends with the fishmonger, and had a feast of fresh branzino and orata that we stuffed with herbs and grilled over a wood fire. In Sarnano, a larger town near us, the market is sprawling, covering most of the village. Basically, if you can’t buy it at the Sarnano market, you don’t need it. Everything from an array of ladies undergarments to an egg poacher to a live chicken is for sale. We picked up some lovely produce, porchetta, cheeses, a few fresh plants to add to Casa Zazza’s herb garden, and a few presents to take home. 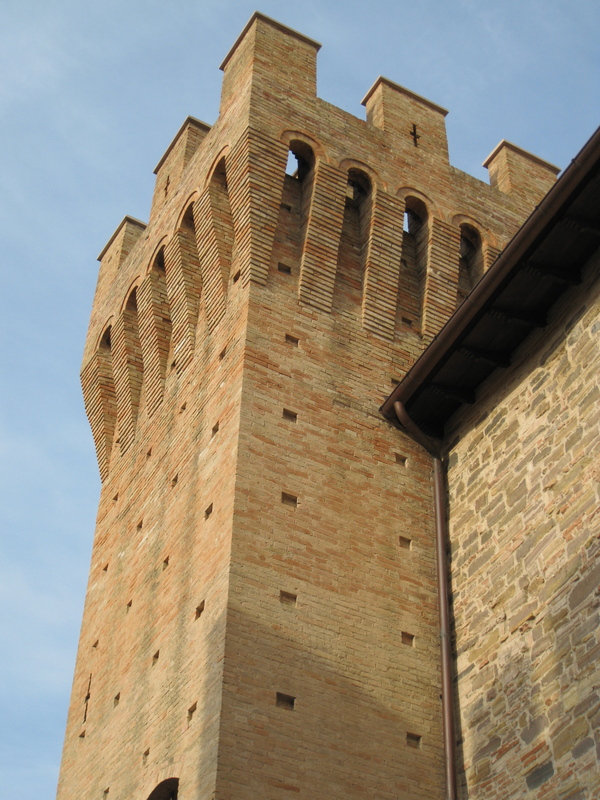 Onward from Sarnano, we visited Castello Pallotta, an old castle (origins dating back to 785 AD), still privately owned, in nearby Caldarola. Listening via headsets (not unlike the tour I took at Graceland, that other cultural hot spot dating back to 1939 AD), we learned about the history of the castle. While there wasn’t a jungle room or tales of peanut butter and banana sandwiches, the castle’s history as a military base turned into a summer house by the Pallotta family was very interesting. It was almost like being plopped into castle life, hundreds of years ago. Original furniture, decorations, clothing, tools and implements were all on display. The castle is in a very pretty spot with wonderful views. Well worth a pop in. After our visit to Caldarola, we made a quick stop in San Ginesio. This town merits a repeat visit because it’s so picturesque, with gorgeous views of the Marche countryside. 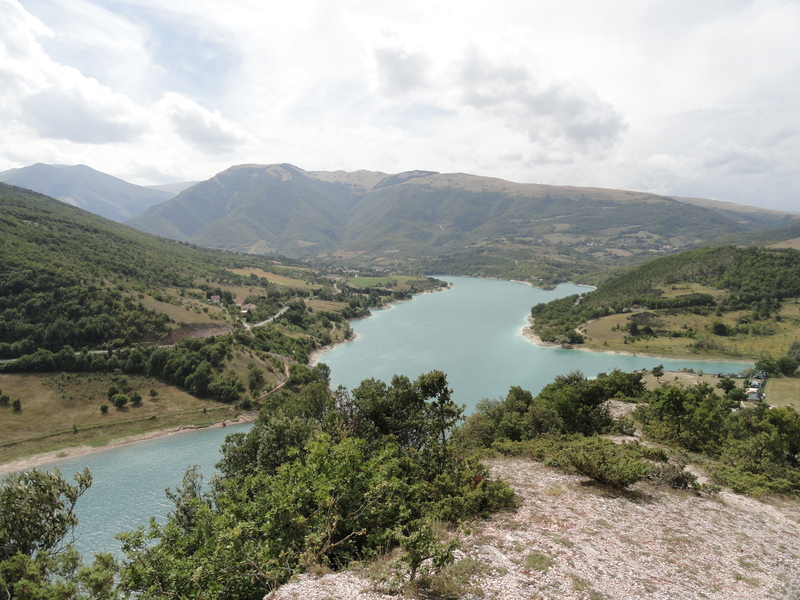 The next day, our planned activity was hiking around Lago di Fiastra, a very pretty man-made lake in the heart of the Sibillini National Park (there are only two natural lakes in Le Marche — go figure). From Casa Zazza, we drove West and into the Sibillini mountains. The drive was gorgeous, with dramatic views of the mountains and surrounding countryside. We arrived at the lake, walked across the top of the dam erected to create this spectacular body of water, and then up a trail taking us high above the lake for amazing views. The water was a gorgeous turquoise blue and the sun shone brightly, even though it was super windy. After taking in the breathtaking views, we were ready for lunch at Osteria del Lago, just a hike back downhill and a short drive away. We were seated immediately at a nice table outside, and sheltered from the wind. Our waiter did what I love best in Italian restaurants, he told us exactly what we were going to eat. I don’t even think we saw menus. We split two pastas among the five of us, tagliatelle with black truffles and tortellini with some kind of sugo. And then we shared plates of roasted lamb and veal roast. Plenty of food for us, even in our hungry post-hike state. We all ordered caffé (espresso) and were treated to a complimentary anisette (not just one, that would have been awkward — we each received our own anisette). And then we were off, ostensibly to see a gorge at Monte Cavallo, but it was raining gatti e cani, so we turned back for Sarnano. The butcher was open when we arrived back in Sarnano around 4:30 p.m., so we picked up a roaster and a few bottles of wine to fortify our supply, and returned to Casa Zazza. We made a lovely roast chicken dinner (an Ackerman family tradition in Italy) along with green beans with toasted pine nuts and a fennel salad. We spent the rest of the evening regaling each other with tales of our past trips to Italy ,while some members of our group kept an eye on the TV and the comely weather ladies (seriously, Dad and Bob?). Just another lovely night in Le Marche! Lots to explore in Marche, and I think we’ve only scratched the surface! Let’s throwback some vino Italiano on the next Throwback Thursday!